Waste Tank Cleaner and Sanitiser. Toiblue Recirc Clear. Ideal for large plastic or metal effluent tanks, Recirc HD2 Clear is an all round sanitiser and maintenance product, which kills bacteria, removes residues and cleanses the insides of tanks to reduce / eradicate unpleasant odours. This clear, formaldehyde-free product has a pleasant berry perfume and is used in low concentrations (2-5 litres) as the tank is being used and/or as part of your yearly maintenance schedule, in a higher concentration (10 litres). As a clear product it also solves problems associated with high levels of dye discharge, particularly at smaller Waste Transfer Stations / Waste Treatment Plants. For trailer based holding tanks or stand-alone effluent tanks (e.g. Tuff Tank) as a general guide, dose the effluent tank at between 2 litres and 5 litres dependent on the tank capacity and frequency of servicing. This will keep tide marks and potential smells in check on an ongoing basis. 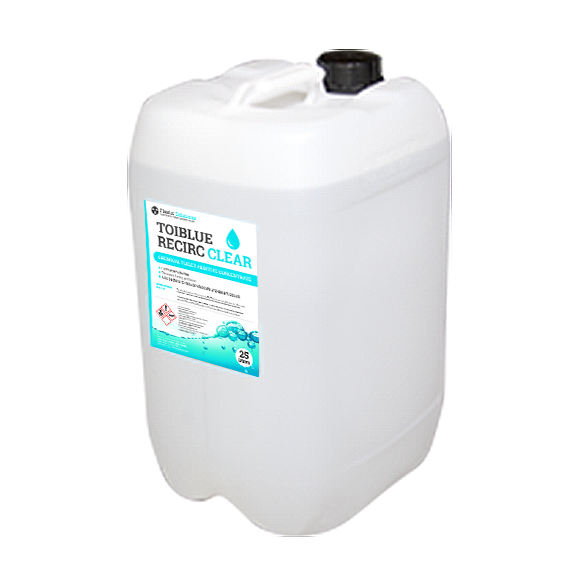 For standing tanks requiring a yearly overhaul, to allow the product to work, empty waste tank, dose with 10 litres of Recirc Clear and then fill with water. Allow to stand for several days. Lift waste tank's inspection lid and add 5% Recirc HD2 to 95% water (for light soiling) or 10% Recirc HD2 to 90% water (for heavy soiling). e.g. for a 200 litre waste tank add 10 litres of HD2 Recirc to 190 litres of water. 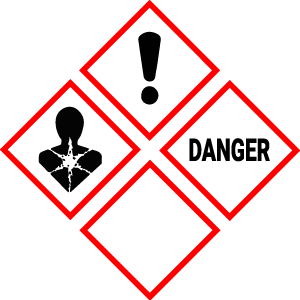 Agitate the mix - usually achieved by driving the trailer around for a minute or two - so that the cleaning solution is in contact with all surfaces. If necessary, you may also flush the solution through toilet cisterns into toilety bowls. Allow to stand overnight (at least) or for 24 hours (for best results). For stubborn toilet bowl staining, agitate with a toilet brush. Empty tank, clean inside with a pressure washer or water jet (if possible), refill with fresh water, flush through again and then drain down. The trailer will now be ready for its next event.